Building a social network to market your small business brand takes effort and time, because you are building relationships with your customers, and not simply distributing advertisements. Each social media outlet has its own characteristics to consider. Facebook profiles are for people and Facebook pages are for businesses. 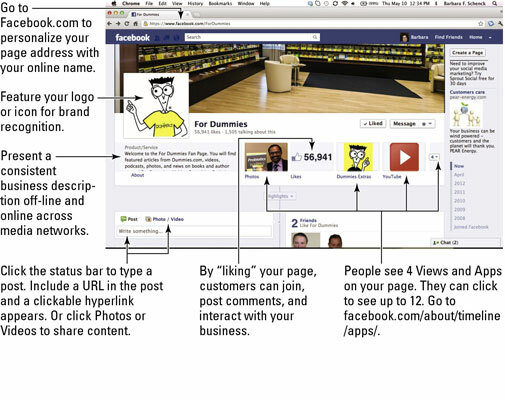 A page gives your business presence on Facebook. It provides a place Facebook users can go to access information, news, and offers from your business. Plus, when users “like” your page, your updates appear in their Facebook news feeds, where they can click to interact with your business. If you have a physical business, develop check-in incentives so when Facebook users walk through your front door they can “check in” using their mobile phones, letting their friends know where they are. You can survey your page followers for free by using the easy Question or Poll tab. You can promote events for free using the Events tab and invite customers, receive RSVPs, and monitor anticipated attendance. Twitter is a messaging tool. In short posts of 140 characters or fewer, people tell what they’re doing, what they’re reading, who they’re listening to, and what they find interesting. Businesses use Twitter to share news, tips, and useful information. They also use it to stay on top of news and opinions in their market areas. In the process, they acquire connections and stay in touch with local or far-flung audiences. Don’t start spewing sales pitches, or people will drop your feed faster than they can finish the cup of coffee you didn’t want to read about. Instead, use your tweets to draw attention by sharing information and links to content that your followers will want to share and that — and this is your ultimate objective — makes them think more highly of you as a valuable business resource. For everything you could possibly want to know about why and how to use Twitter, read the Twitter Guide Book by Mashable.com. Mashable is the largest independent news source dedicated to covering digital culture, social media, and technology. After your Twitter account is live, consider following @Mashable to stay on top of the latest news. LinkedIn is the world’s largest professional network. If you use business cards, Rolodex files, and networking opportunities, you have a basic understanding of how LinkedIn works. It helps you exchange knowledge, ideas, and opportunities with your contacts and those they’re connected to. You can set up a LinkedIn profile for free. What’s more, LinkedIn profiles rise to the top of search results for your name, allowing you to control the information others see about you. Probably the most compelling benefit of a Google+ business account stems from its Google heritage. If your business is on Google+ and you develop an active Google+ community, your business is more likely to appear high in Google search results, and we all know what that means: website traffic. Connections: After you open a Google+ business page, you can put a +1 button anywhere you’d like, allowing your business to easily invite people to simply click to follow and recommend your business and products or services to friends and contacts across the web. Target sharing: As people follow your business, you can choose which Google+ circles to add them to based on their interests and their relationship with your business. Then, when you post content, you can make your posts public for all to see or you can make them visible only to followers in one or several circles. Collaboration: Through Google Hangouts, you can invite people from your circles to come to a video conference after you install the Google audio and video plug-in available. Measurement: Google’s measurement tools show you what people are saying about your business, how many +1’s your business receives, and how your online activity affects your site traffic. Think of a corkboard where you pin pictures of your wish list and favorite memories and you have a good idea of what Pinterest is about. Except Pinterest goes further, letting you browse and re-pin images and videos from others as part of a global share-fest that, as of early 2012, was driving more online referral traffic than YouTube, Google+, and LinkedIn combined. Businesses use Pinterest just like individuals do, creating boards on a range of topics that reflect the character of the brand and interests of customers, and then pinning business-generated content, re-pinning images from others, and calling for and pinning content from followers. The easiest way to lead people to your business is with a free Google+ Local page and Google map. To get going, all you need is a physical mailing address, a free Google account, and a location in a country where Google Places is available. People using foursquare arrive at a business, check in, and compete against others to become the mayor by racking up the most check-ins. What’s in it for the business? Every check-in is free advertising within the customer’s social media network.